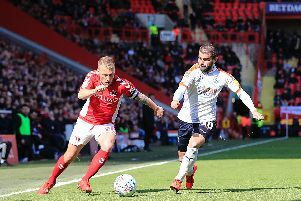 Midfielder Hong Wan scored the equaliser for Luton as they held an experienced Plymouth side to a 1-1 draw at Home Park in their Central League South clash on Tuesday afternoon. The teenager, who has been with Yeovil Town U18s, where he was captain, pounced in the 85th minute to draw the visitors level against a strong Argyle outfit containing on-loan Hatters defender Lloyd Jones. Town on the other hand, selected a team full of U18s, with only Jake Peck, Connor Tomlinson and Josh Neufville having featured for the first team previously. Luton had the first chance to open the scoring after just four minutes, when a curling attempt from Jonas Kalonda cannoned against the post. The hosts then went close on 13 minutes as Paul Anderson’s left wing cross was met by Alex Battle, Town stopper Tiernan Parker making an excellent low save. Parker was called into action once more, pushing away a close range volley from midfielder Dan Rooney after he was picked out by Ashley Smith-Brown. Plymouth then took the lead on 32 minutes when Anderson and Battle combined for Rooney to break the deadlock with a composed finish. Town almost had a leveller as Tomlinson’s powerful attempt was pushed behind by Pilgrims keeper Mike Cooper. In the second half, Argyle almost made it 2-0, Anderson’s cross finding Oscar Threlkeld, who blasted over. Luton skipper Neufville was wide of the mark, before they levelled with five to go, Neufville getting to the byline where his cross was converted by Wan. Argyle: Mike Cooper; Tafari Moore (Harry Hodges 63 mins), Mike Peck, Lloyd Jones (Isaac Burdon 77 mins), Ashley Smith-Brown (Ryan Law 63 mins); Oscar Threlkeld, Tom Purrington, Dan Rooney; Alex Battle, Alex Fletcher, Paul Anderson (Lionel Ainsworth 69 mins). Hatters: Tiernan Parker; Avan Jones (Sam Scott 75 mins), Drew Richardson, Corey Panter; Hong Wan, Jake Peck; Josh Neufville, Joshua Boorn (Jardell Stirling 63 mins), Jonas Kalonda (Magloire Junior 75 mins); Connor Tomlinson.